Civilisation is trembling on the brink. Culture, art and science have flourished under your enlightened rule. however, dark clouds hover on the horizon of your domain. Your advisors are divided, your people troubled. Can you chart a trusty course through the rocky road of history and bring your people the glory and happiness they so richly deserve? 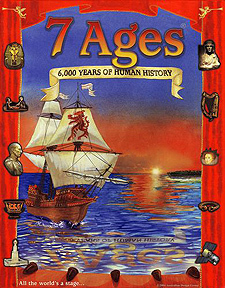 7 Ages is a fun game for the whole family of 6000 years of world history. From ancient Babylon to modern metropolis, up to 7 players create and nurture 110 of the world's greatest civilisations from an uncertain start to a glorious zenith by implementing cultural, scientific, and religious advances throughout your realm. All the great kings and queens from the past, and all of history's greatest scientists, artists, and philosophers live again. In 7 Ages, history comes alive. Are you game? 2x A1 (594x840mm) full colour maps of the world.